Letter to H.E. 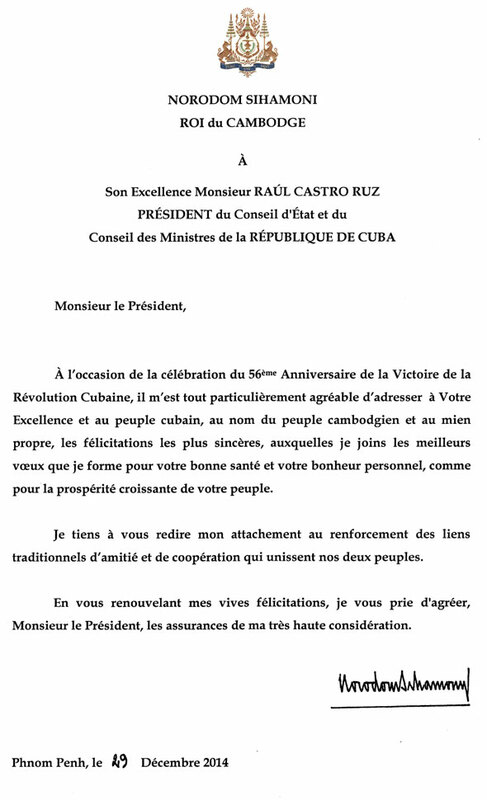 Mr. RAUL CASTRO RUZ, President of the Council of State and of the Council of Ministers of the Republic of CUBA. Letter to HE Mr. KLAUS IOHANNIS, President of ROMANIA. Letter to H.E. Mr. FUAD MASUM , President of the Republic of IRAQ. Letter to H.E.Mr. JOKO WIDODO , President of the Republic of Indonesia. Letter to H.H. Sheik TAMIM BIN HAMAD AL-THANI EMIR of the STATE of QATAR. Letter to H. E. Mr. NURSULTAN NAZARBAYEV President of the Republic of KAZAKHSTAN. Letter to H. M. HAMAD BIN ISSA AL-KHALIFA King of Bahrain. Letter to H.E. Mr. DAVID JOHNSTON, Governor General of Canada. Letter to H.E. Mr. REUVEN (RUVI) RIVLIN, President of the State of Israel. Letter to His Majesty BHUMIBOL ADULYADEJ, King of Thailand.